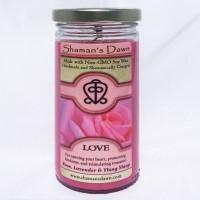 Hand made with essential oils and shamanically charged with prayer and intention Shamans Dawn candles are hand made with essential oils and are then charged with their healing intentions. 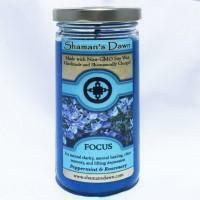 This is done through prayer and shamanic ceremony to ask for the aid of helping spirits. 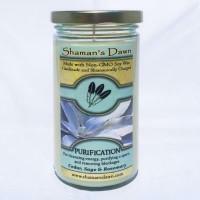 Light a candle and set your intention or prayer to help manifest changes in your life. Each candle is labeled with a shamanic healing symbol that embodies the healing intentions of the candles.The candles are 6 inches tall and 3.5 inches in diameter Burn Time: 50 hours Our candles are hand poured with non-GMO soy wax to encourage sustainable and environmentally conscious alternatives for candles. 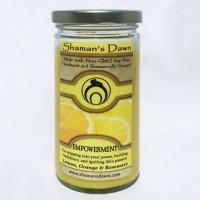 One of the primary things that sets Shaman's Dawn items and supplies apart from other sources is that they are all blessed during shamanic ceremony. 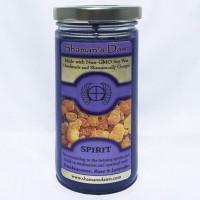 This is done to "wake up" the plant spirits that are present in the botanicals and oils in these items and also calls forth the medicine of the healing spirits to touch and bless these items. 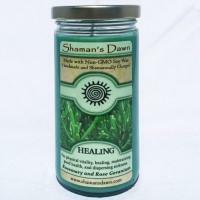 Another aspect of this process is that our candles are all labeled with healing symbols. These healing symbols also carry their own medicine and are awakened during the blessing ceremony. The blessing ceremony is conducted around a "Mesa". This is a sacred altar used in Peruvian shamanism which contains very particular medicine objects that "anchor" the different medicines of creation into it. The Mesa becomes a microcosm of all of creation when it is activated. Offerings are then given to the healing spirits as they are called in through whistles, rattles, chants, and medicine songs. 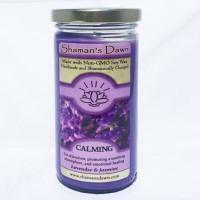 Made with Essential Oils of: Lavender & Ylang Ylang; Scent: Herbal lavender scent with sweet jasmine undertones Color: Purple Burn Time: 50 hours; Use for: relaxation, creating a soothing atmosphere, and to promote emotional healing. Our candles are hand poured with non-GMO soy wax to encourage sustainable and environmentally conscious alternatives for candles. Made with Oils of: Lemon, Bergamot, and Orange; Scent: Invigorating citrus with accents of rosemary; Color: Yellow Burn Time: 50 hours; Use for: stepping into your power, building confidence, and igniting personal passions. Our candles are hand poured with non-GMO soy wax to encourage sustainable and environmentally conscious alternatives for candles. 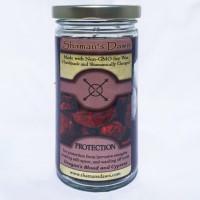 Made with Oils of: Cypress and Cedar; Scent: The spicy and sweet scent of dragons blood incense; Color: black Burn Time: 50 hours; Use for: protection from harmful energies, creating a safe space, and warding off intrusive energy. Our candles are hand poured with non-GMO soy wax to encourage sustainable and environmentally conscious alternatives for candles. Made with Essential Oils of: Cedar, and Rosemary; Scent: A woodsy combination of cedar wood and white sage; Color: white Burn Time: 50 hours; Use for: cleansing energy, purifying space, and removing blockages. Our candles are hand poured with non-GMO soy wax to encourage sustainable and environmentally conscious alternatives for candles. 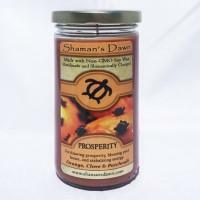 Made with Oils of: Frankincense, Lavender; Scent: earthy floral - Color: Indigo; 6 inches x 3.5 inches - Burn Time: 50 hours; Use for: inviting in the energies of the divine and the helping spirits, and to aid in spiritual work. Our candles are hand poured with non-GMO soy wax to encourage sustainable and environmentally conscious alternatives for candles.